Deja Vu produced three tiny pups. Last time we mated her we ended up with one, so we are thrilled to get the three babies. These were taken the next morning after they arrived–day one. We just had to capture a few photos of the moment. We all can attest to how quickly a pup grows. By four months, they are looking adult-like. They are powerful and fast as lightning. Yes, the young pup can look deceptively quiet, calm, and lazy. There are only two speeds–any Weimlover knows that is the truth. There is on–which is also known as full speed ahead. Then there is off–it might be a lazy stroll, a snuggle, or more than likely a flop. I’m done. For now, they have one focus–nursing and staying warm. It is enough. Just had to send you a quick update on how our girl is doing. She is so wonderful! Of course, the puppy stage is extra busy but she is doing so well with house training (only one accident!) and getting used to her crate. Last night she actually slept all night in her crate next to our bed without any whining and woke up so happy. She certainly has a big personality and she has bonded very well with us so far. She follows me around all day and I just love it (velcro dog :)). It was really cute on the long drive home because she just wanted to be in the back of the car with the kids. They absolutely adore her! I think I told you that my oldest son cried tears of joy for about an hour after we picked her up. He said he just loves her so much already and it is a dream come true. I remember getting our Weimaraner as a kid when I was six and the instant love that I felt for her. Anyway, thank you again for a fabulous experience and all your work in getting her prepared for the transition. It’s clear that she had an introduction to house training and being in the crate and you’ve made our job easier! Thank you, Haley, for sharing your news. It is more than welcome. We did prepare the pups for their arrival. I cannot claim they are housebroken or crate-trained. We do prepare them to succeed–even then, the transition can be precarious. It is fabulous you are doing so well. The Weimaraner is home. Memories are being made. How can anyone who has not experienced a childhood Weimaraner understand what you mean? I think it would be impossible. 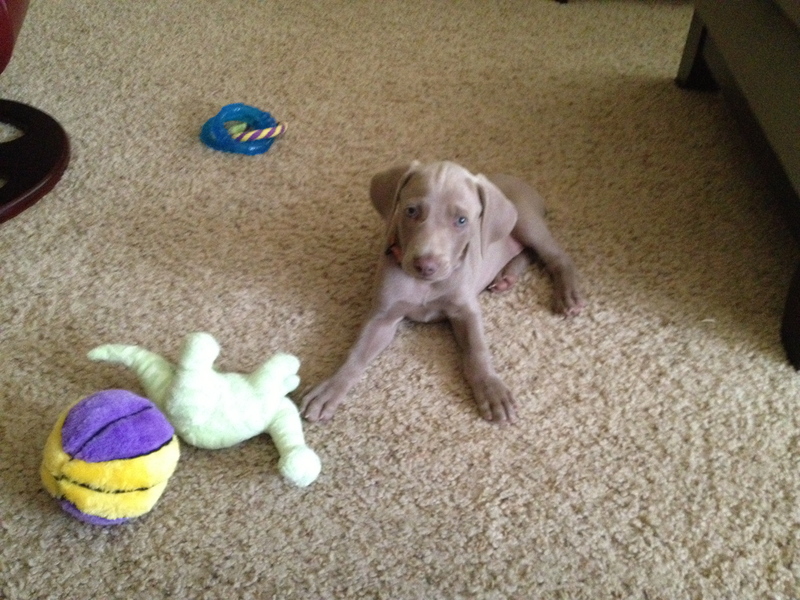 Click here to read about Cliff’s first Weimaraner. Technology makes it so much easier for us to capture countless photos. We count ourselves lucky to have a couple of photos of Cliff and Doc. Thank you, for being a part of the OwyheeStar family. It’s been an eventful few weeks; however, Loki and I had a fairly uneventful trip back home. We stopped by Walla Walla on the way to see my family, who fell in love with Loki—I wasn’t sure they were going to let us leave! There were a few housebreaking accidents the first week… but I’ve learned pretty quickly. So has Loki. He goes to work with me every day and has the office under his spell. He is curious and friendly with strangers, and though he is quiet in new situations, he comes out of his shell once he’s had a chance to take it all in. We are so happy to hear from Erica. She sent us a lengthy update which we will break into three parts. We appreciate her detailed explanation of the experience thus far. There is more at stake with Loki–as he is hopefully going to become a part of the Search and Rescue (SAR) team with Erica. This pup is her first to train for SAR, so there is a lot to consider. Nothing but the best combined with attention to every detail– at the same time she keeps calm and collected. This approach will get the desired result. Finally, let’s all remember raising your first pup is a growth experience. Well–raising the Weimaraner is always a growth experience. They require you to dig deep and to get ahead of the stuff that comes with as well as to avoid being reactive. (OMG) Well, anyone who has been down this path knows that there are surprises. Some are welcome and others not so much. More than anything, the Weimaraner needs to bond and develop the desire to want to please you. Of course, that doesn’t mean they do not have to obey and achieve specific necessary skills. There are those who became so enamored with their intelligent and engaging pup that in the excitement they forgot this is a journey for the Weimaraner and their human. Respect is a two-way street. We cannot wait to see what Loki and Erica achieve together. It is not a race with a time limit. It is a journey to see what they (Erica and Loki) can accomplish as partners. We made it safely home yesterday afternoon to Portland. We were all exhausted after the long drive and Dudley our other Weimaraner was pouting all the way home. He didn’t quite know what to do with our little one, whom we named Oakley. We made it all about Dudley yesterday and last night. He got his usual walk by himself and business as usual. Oakley is intent on following his new big brother. Wherever he goes he wants to go. Dudley quickly got used to this but is not ready for Oakley to snuggle with him, as Oakley would like. They’re also learning to share me as you can see from the photos. We figure as long as we don’t force the issue that they will get along soon. They play well together … chasing each other in circles. Oakley is quickly learning potty training. No accident so far, knock on wood. We take him out every two hours or so and he does his business and decides to come back in. He’s learning from his big brother, sit. I tell Dudley to sit and Oakley seems to automatically do what his big brother does. It’s quite cute. We’ll keep you posted on how they progress. But we’re loving Oakley to pieces. :). Wow! You are doing so well with the introductory process. I know you are right. Things will continue, and Oakley and Dudley will be inseparable. We look forward to hearing more about the adventures of the two. Keep up the great work. With the New Year and the idea of setting a New Year’s Resolution forefront, we might consider one. Another time we set these kinds of unrealistic and humorous goals is when we bring home the new Weimar. We say to ourselves that we are not making the same mistakes as last time. (oops) We pronounce things will be different. Maybe we say they are not on the furniture. (OMG) Well recently, we have heard many such a proclamation. Come on folks; we are all with Jeff and Marisa. Remember a couple of weeks ago when our blog featured the lovely Schatzi? If not click on her name to see that post. Have we not all been here? Well, consider this–it is typical that we go the way we went before or make new mistakes. Maybe you understand for what I speak. Luna has made herself right at home and we have officially fallen in love! She slept in her crate next to the bed last night and alerted us to go out at 2 and 6:30.